Creating mobile-ready courses and powerful eLearning experiences doesn’t have to be time consuming and stressful. Thanks to the robust and flexible authoring tools available today, such as Trivantis Lectora Inspire 12.1, eLearning professionals can create eLearning courses without this headache. In this article, I’ll take a closer look at the features, pricing, ease of use, and support services offered by Trivantis Lectora Inspire 12.1, so that you can determine if it’s the ideal solution for your eLearning design and development needs. Trivantis Lectora Inspire 12.1 is the first authoring tool to feature eLearning Brothers’ templates, interactions, and cut-outs. It boasts the same user interface as Lectora 12, with an extended library of course starters and eLearning game creation tools that you can use to develop engaging and interactive eLearning experiences. With just a click you are able to deliver dynamic HTML, SCORM-compliant, and AICC courses, even if you have no prior programming experience. eLearning Brothers Lectora Template Library. Lectora Inspire 12.1 gives you the ability to build eLearning scenarios, navigation players, course starters, and eLearning games that enrich the eLearning experience. Simply access the Inspire Tools, choose the Template Library, and create amazing learning materials. Quickly develop HTML5 and Flash-based games and eLearning interactions using the eLearning Brothers Interaction builder. You can also add your own text, audio, and images into the eLearning course design. Lectora Inspire 12.1 features Snagit and Camtasia, giving you the power to capture screenshots, customize captures, and add in special effects. You can also record screen images to create interactive tutorials and record your eLearning videos. With the TechSmith Fuse free mobile app, Lectora Inspire 12.1 users are able to create mobile-friendly videos for their mobile learning courses. Lectora is, and always has been, an HTML authoring tool. This means you won’t have to worry about mobile or browser compatibility issues, as is sometimes the case with Flash-based eLearning courses. eLearning experiences that are built in Trivantis Lectora Inspire 12.1 can run on any browser and any mobile device. The issue that many authoring tools have is not being able to deliver an immersive and interactive eLearning course that can run smoothly. If you fill your eLearning course with branching scenarios, multimedia, and other engaging elements, you run the risk of slow load times and frequent crashes. Trivantis Lectora Inspire 12.1 has “inheritance” capabilities, which gives you the opportunity to upload an image, navigation button, or any other multimedia component just once, and then use it time after time throughout your eLearning course. For example, you can integrate a graphic into your eLearning design, and then have it run on every page. This allows you to create highly interactive eLearning courses that your audience can access quickly. As is the case with all Trivantis authoring tools, you can try Lectora Inspire 12.1, 30 days for free. If you decide to buy, the licensing ranges from around $2,495.00 to $2,790.00. This includes all of the template and interaction libraries, as well as their comprehensive support services. Lectora is known for its intuitive user interface and navigation. In fact, its unique layout is reminiscent of a book with chapters and pages. If you are familiar with PowerPoint, then you will be able to master the tool quickly, thanks to the Lectora ribbon menus. The software features an internal content management system that enables users to design a wide range of assessments, including true/false, multiple choice, essay, short answer, and matching questions, as well as surveys. In addition, the eLearning Brothers libraries offer a variety of different learning resources, which makes this an all-in-one eLearning authoring tool. Trivantis offers a toll free number that you can call during business hours (7:00 am to 7:00 pm ET) and a contact form on their site. However, the true gem of Lectora support is their thriving online community. If you have an issue or need help using the tool, simply log in to the forum and benefit from the experience of other eLearning professionals. You can also help other members who have questions or concerns. There are training seminars available for an additional fee, such as Lectora Extreme/Games and Lectora Fundamentals. The training team comes to your office to show you the ins and outs of the program, or you can come to their training locations. The website also offers product user guides in addition to live demos and multiple webinars every month with an advanced sign up. 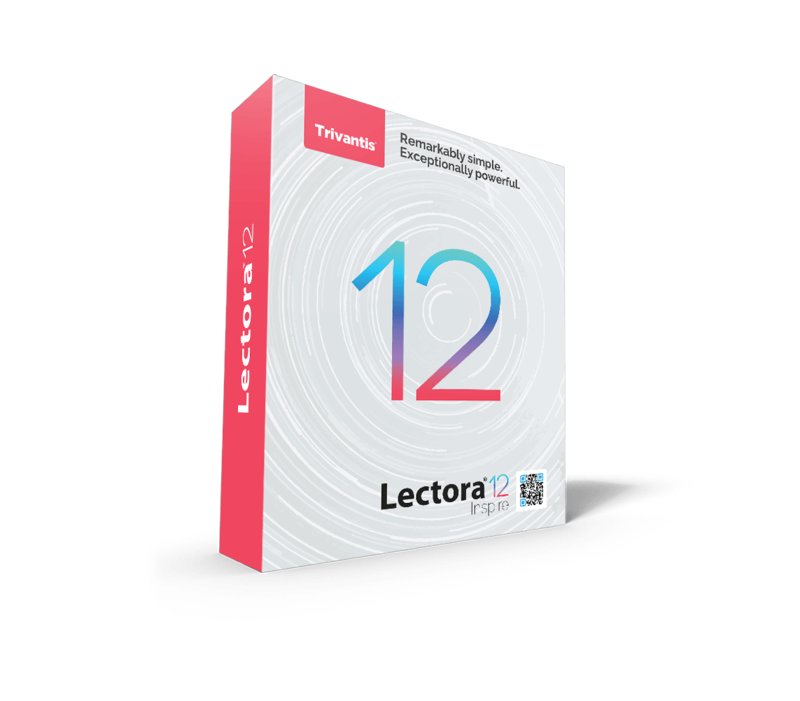 Lectora Inspire 12.1 is a versatile tool that works for both eLearning teams and solo eLearning professionals. It’s easy to use, and offers a variety of flexible design tools that more experienced Instructional Designers can use to customize every aspect of their eLearning course. It may come with a higher price tag than some of the other authoring tools on the market today, but it’s robust, flexible, and offers a wide range of features. If you’re new to the eLearning industry, you can use the pre-set templates to create an engaging eLearning course. Those with more experience under their belts can develop custom HTML5 code to create a dynamic and mobile-friendly course. Every eLearning professional, regardless of experience level, will enjoy the vast selection of content featured in the eLearning Brothers libraries. Rather than spending a great deal of time scouring the web for the perfect graphic or cut-out, you can simply access the library and insert the ideal image. The fact that Snagit and Camtasia are also integrated into the software is the icing on the cake, as it gives you the ability to capture, edit, and integrate screen shots and videos into your eLearning course in a fraction of the time. Last but not least, Lectora Online is Trivantis’ offering to the world of cloud-based course authoring. This online version offers the same features and flexibility with Trivantis Lectora Inspire 12.1, but with the added bonus of anytime, anywhere access and collaboration. If you are interested to learn more, I highly encourage you to read the Trivantis Lectora Online Review to find out the most notable features of Trivantis Lectora Online, the pricing, ease of use, and support services that you may want to factor into your decision-making process.